Up until a couple of years ago, I’d never been really into fashion before and I hadn’t realized the art behind designing clothing. 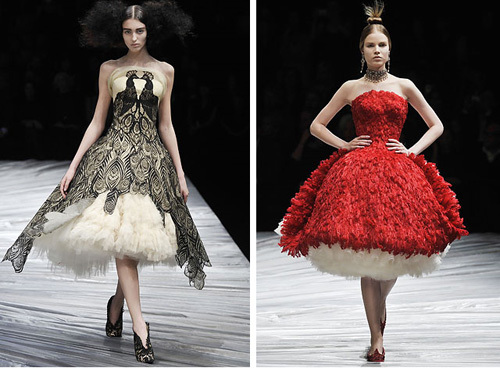 Then I learned about Alexander McQueen. I looked up images of his clothing, admired his work when Lady Gaga wore it, and was devastated that just as I was learning about this visionary he took his own life. The official exhibit photo. Breathtaking. Tonight, yeah baby. Tonight, yeah baby. Just love yourself and you’re set. So much of what I’ve written lately has been reactive. It’s often the horrors of reality that move us to words to educate and bring about change. I guess that’s my typical m.o., but lately, I’ve been thinking about the wonder that words held for me when I was younger. To say something out loud, to write it down, to share it with others gave it this incredible power. I’m not sure when I forgot that, but I want to reignite that fascination with the power of words, communication, and human connection. Too often, we’re bombarded with images of products that can help to improve us in one way or another. It’s so easy to think of what you could change about yourself if given the chance, even for the most optimistic people. But what if we could take that power held in words and unleash it in a way to love and accept the truly wonderful things about ourselves? Just love yourself and you’re set, Gaga says. Take a few minutes for yourself. Breathe deeply, listen to your favorite song, close your eyes, just do something for you. Now, think of 3 things (or even just 1!) that you love about yourself. It might take a little digging to find your “I love me” words, but trust me, it’s totally worth it to remind yourself how important self-acceptance is. Now, take those words and write them down. Post them here as a comment. Tweet them (#ilovemewords). Tell your friends. Do something to give those words power and remind yourself that you accept you for who you are. 1. I laugh at everything. A lot. I’m such a giggler. 2. I am honest and dependable; I can’t lie and can’t imagine letting someone down. 3. I love, love, love my little waist that totally sets off my hourglass shape. Yes. This post was brought to you by Dawn, who is probably giggling right now at who-knows-what.